Traveling with the family? 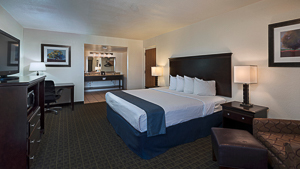 Why not choose a Double Queen Room for your visit to Carlsbad. Our delightfully comfortable queen beds provide the promise of a good night's sleep, so you can unwind and leave the hard stuff to us. No matter what your notion of comfort, we have what it takes to accommodate you and all of your additional guests at the Stevens Inn! Warm, welcoming, and inviting, the King Guest Room at the Stevens Inn is the perfect place to relax or play. 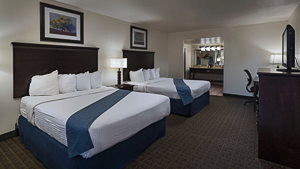 This spacious guest room is stocked with all of the necessities for a memorable stay in Carlsbad, including a dreamy king bed that will have you reaching for the snooze button in the morning.